In light of ManCup’s decision to rename Pro Comp back to Pro Mod and bump the turbos to the new Pro Open class, quite the debate was started on Facebook. Please check the Cycle Drag Facebook page if you have not already. Here is my response to this very compelling argument. I am truly entertained, educated and intrigued by this debate. I thank all of you for continuing to contribute and add input. After reading the Facebook debate and taking a step back out of the trees to glance at the forest, my biggest take away is the alarming reality that pro-style, motorcycle wheelie-bar racing is in a major state of decline. If Pro Mod was drawing 30 entries, like it used to, or if Pro Comp was drawing 30 entries, like it did in 2010, I don’t think we would be having this debate. Any promoter would be foolish to try to alter something so prosperous. I know Dave Schnitz is way too smart to. He has a great mind for the sport and is making a change to try to attract more entries. Will it work? That is the question none of us can answer right now. That is also what makes this debate so interesting. Let me preface my opinion by stating, I’m simply a fan. I’m an announcer, a journalist and true admirer of the sport. My opinion could be quite different from those of you who are out competing and spending a fortune to do so, which is why I give a ton of credence and respect to everyone’s take. I have the easy job. 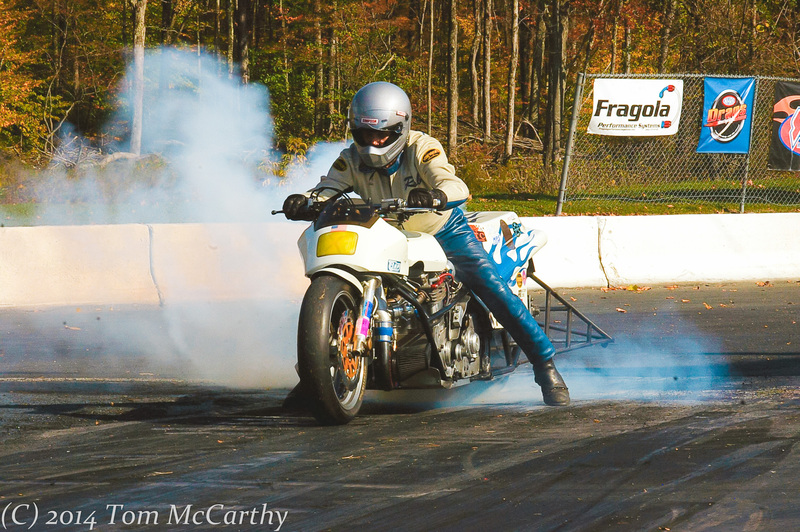 Rob Giard of Ware Massachusetts, seen here testing his Puma powered, turbocharged, alcohol fed, Funny Bike. Also, I fell in love with the sport in the 90s and thought Keith Kizer ‘s AMA Prostar captured the pinnacle of dragbike racing when you had factory involvement and full fields in all of the Pro Classes. 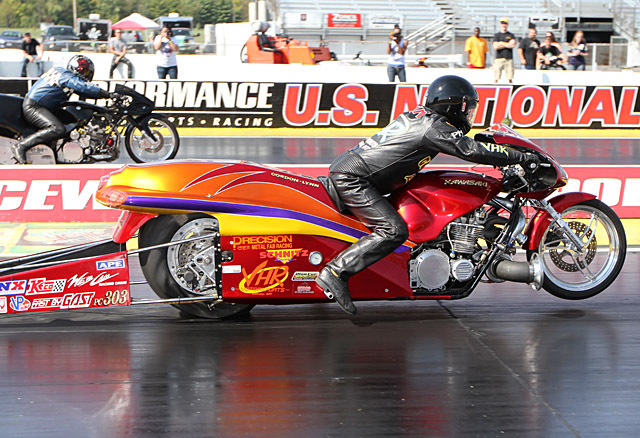 The lineup was logical and easy to understand – Pro Stock (Gas), Pro Mod (Nitrous), Funny Bike (Turbo) and Top Fuel (Nitro). But sadly, bike counts began to erode, particularly in the turbo class. Legendary Funny Bike racer Tommy Bolton in the glory days of the class. was never the same. Maybe it was the final blow or maybe Kizer and his visionary foresight already saw the class limping to extinction? We could debate that one. 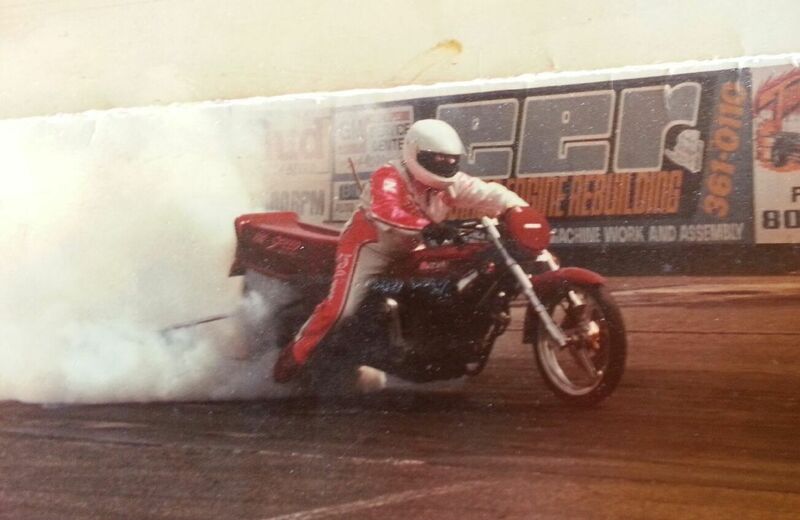 I must give legendary Pro Mod racer Bill Vose a ton of credit for bringing to light on Facebook just how badly outdated the Funny Bike class as a whole is. How many current Funny Bike chassis are really out there right now? How about ones with modern 10.5 inch tires? The great chassis builder Walter Timblin would know.This is racing. 15 years old is a vintage. 30 years old is a dinosaur! As a lover of diversity, showmanship and performance, I have always had a soft spot in my heart for Funny Bikes. I miss the days of Steve Rice, Gary Clark, Korry Hogan,etc. I love the exotic setups, I love the sound, I loved it when Chip Ellis would glance back at Steve Rice 15 times while revving that monster up. Surely, there needs to be a means for these machines to survive? 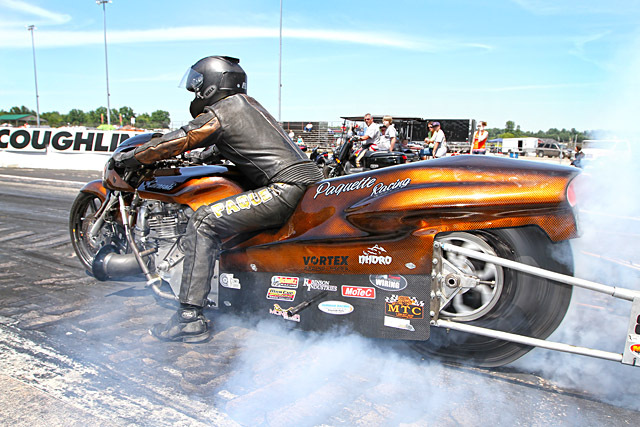 When Scott Valetti introduced Pro Comp at the end of the AMA Dragbike days, I absolutely loved it. The turbos found a way to live on. Instead of 3-4 Funny Bikes and 7-8 Pro Mods, we now had a full field with a bump spot and competitive qualifying. That’s racing the way it should be! This is an important point – I feel any decision to give us (fans, sponsors, etc.) racing, REAL RACING, is a good one. 5-6 bikes in a class is not racing. It’s an exhibition. So while I fully understand the delicate balance of keeping the rules even for the competitors spending thousands of dollars, I think it’s equally important for the competitors to go to extraordinary lengths to make sure they have a show to offer. Otherwise, why even open the stands? In a perfect world the spectators would feed the sport. 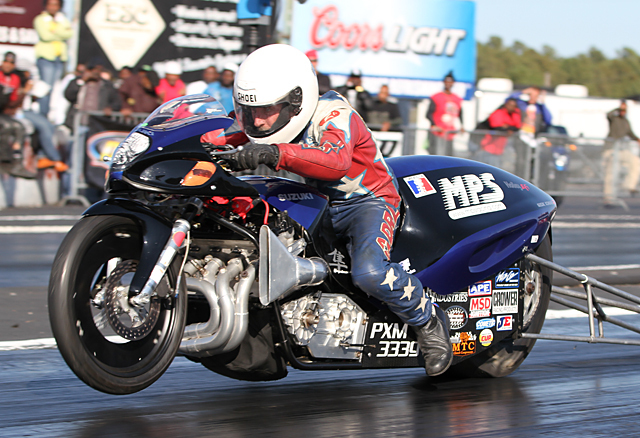 I announced Pro Comp at the 2010 World Finals in Valdosta and it was one of the greatest motorcycle drag racing shows I have ever seen – 30 entries vying for the top 16! How exciting is it when you roll into Q4 and half the qualified field could get bumped? All in one class you had massive turbo-charged Funny Bikes, very cool nitrous GS Pro Mods, Hayabusa Pro Mods, and even a guy who put a dry shot on a Pro Stocker! What a hodgepodge and what a show! 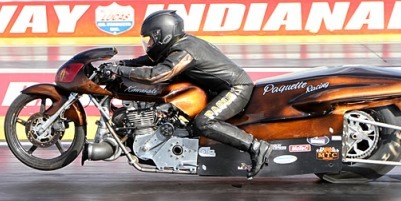 To me that great diversity and innovation is what drag racing is all about at its very core. The diversity adds intrigue. Now, it seems a guy like Mark Paquette (the leader in Funny Bike technology and performance) is a victim of his own success. He has no equals unfortunately. Nitrous bikes are staying away because of him, or at least that is the perception. I see each side of the debate. Nobody is happy bike counts are low. Everybody is losing in that regard. Schnitz wants a change to attract more entries. Vose wants to entice other nitrous competitors to come back by ensuring them they won’t be matched up against a machine with a couple hundred more horsepower. Poor Paquette probably doesn’t want his state-of-the-art machine he has worked so hard to develop and spent so much money on, forced to move over to an uncertain category with unclear and unknown participation. He wants to race the best of the best, Eric McKinney, Ashley Owens, Vose and company. Look, I want Pro Open to work as much as everybody who supports it, but put yourself in Mark’s shoes. Is there really any prestige to the Pro Open class right now? Is there any guarantee it will catch on? 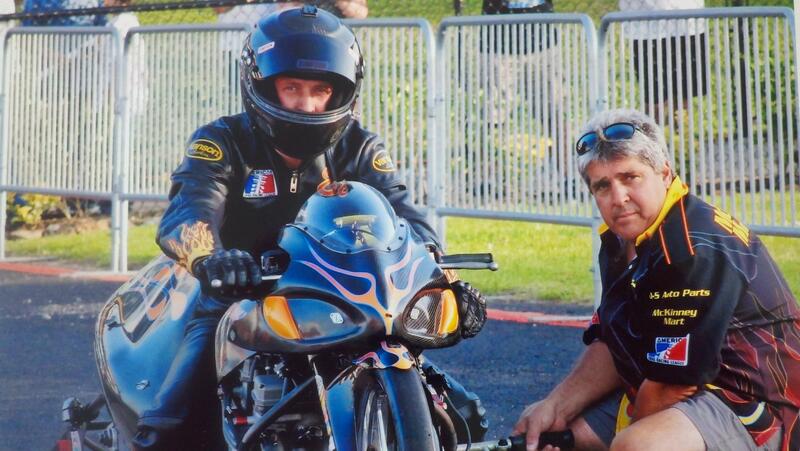 With all due respect to the great Rob Giard, he won the title on a bike that has to be over 20 years old. There is not an easy answer. We all want the same thing, but disagree on how to get there. It was this very debate that caused IDBL promoter Jason Miller to create the 4.60-index class. Great idea, I like it and it’s a wonderful stepping stone. But at the end of the day it’s still not out-the-back-door, heads-up racing, and that’s what fans and “pros” really want. The simple fix is this – the sport needs more competitors and more bikes! New ones! But that’s not easy and we could all debate, at length, what needs to happen for that to occur. The bottom line is this – we all love a niche sport. 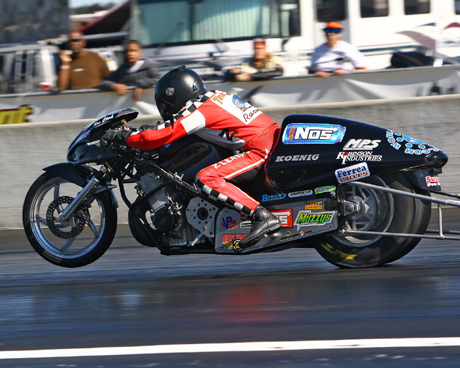 As always, but especially in its current state, dragbike racing needs every entry it can get. For promoters, an unenviable job in this climate, every customer has to feel like they are wanted and appreciated. I can tell you this, if I ran one of these organizations, I’d have the telephone number of every Pro Comp racer in the country and call them regularly. Communication goes a long way. Every effort has to be made for everyone to fit in somewhere meaningful. I don’t care if a motorcycle runs on bananas, find a place for it and find a way to keep that rider happy. Bananas make for a great show you know. I’d pay $20 or more to watch Vose race a banana.Everyone needs to be welcomed. Otherwise the sport will cannibalize. Plain and simple. Above all, IT HAS TO BE A SHOW. If it’s not, then why do we care? And we all want and need to care because apathy is the worst killer of them all. I love turbo bikes,I bracket race them locally,would love to run bike only races,just can’t afford the expense! 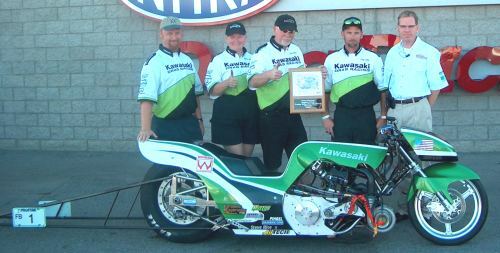 I’ve worked in the motorcycle field now over 23 years & sponsership is hard obtain. to the best of my knowledge, in the past everytime the ProComp class was split at the Turbo level it lost entrants and was disbanded in two years…Pro Street and Pro Street type bikes(Grudge) is the future. I built a ProFunny and the customer didn’t like it because I pulled the front wheel up close to the engine(Pro-Street Style) He call it a Funny-looking bike…is that not what a FunnyBike should make you think? no one wants a New Design just keep looking back at 20 + years, those chassis today will not hold the power that one of my new engine can make. I’m working on Injected Nitro Engine that will fit in a chassis that has Kz engine mounts. The first thing I see is the simple fact of evolution of drag racing from being participant oriented to spectator oriented. 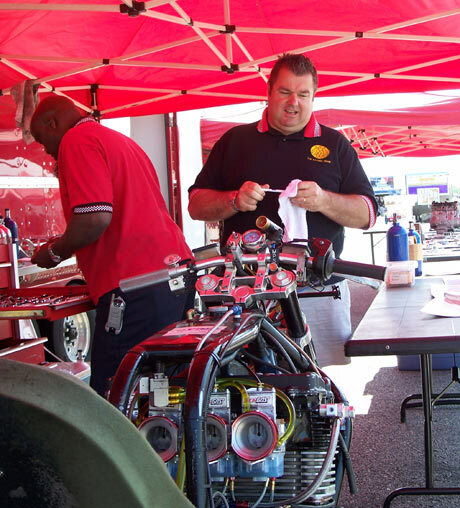 Drag racing has gone from “let me build a machine that’s fast, hopefully faster than yours” to “I need to figure out how to put on a good ‘show’ for the fans.” Not everyone, myself included, can accept that.